High Fashion Scratch Card Guide & Review - Casino Answers! 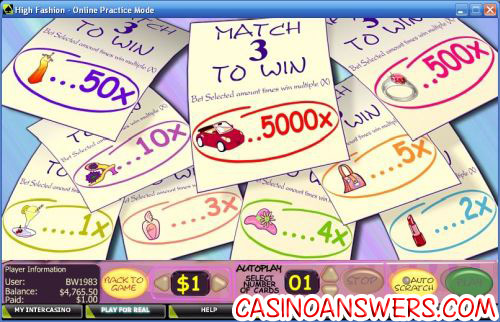 High Fashion is an online scratch card lottery game developed by Cryptologic. You can play the High Fashion scratch card at VIP Casino and Casino Joy. High Fashion is a shopping-themed scratch card. A pretty girl who probably has a dozen too many credit cards looks on anxiously as she’s about to shop ’til she drops. She carries around her little Yorkshire Terrier in a purple purse with stars while she is shopping. She will comment on the games as you play in the form of a comic bubble. The High Fashion scratch card is very easy to play and get into. All you have to do is select your bet ($0.25, $0.50, $1, $5, $10 and $20) and hit the “Play” button to start. The game is laid out in two rows of three shopping bags. You can click on the bags to reveal the symbols or you can select “Auto Scratch” for the game to do it automatically. You must match three symbols to win a prize. To win the 5000X top jackpot on the High Fashion lottery game, you must reveal 3 Car symbols. If you make the maximum bet of $20 per scratch card game and you are lucky enough to get 3 Car symbols, you will win the grand prize of $100,000! High Fashion has an autoplay feature for those shopping addicts out there. You can play up to 99 automatic cards. If you don’t set it on “Auto Scratch,” you will have to open the bags when you play. To play the High Fashion scratch card and nearly 200 other games, sign up at VIP Casino to get a 100% signup bonus up to $225! Are USA players able to play the High Fashion scratch ticket game for real money? 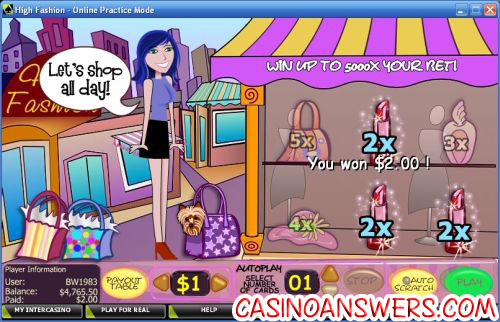 Unfortunately, Cryptologic online casinos are not accepting players from the United States at this time, thus Americans cannot play the High Fashion scratchie for real money. For a good selection of scratch card games, we recommend you sign up at the US-friendly Aladdin’s Gold Casino. Can I play the High Fashion scratch and win game for free? Yes, if you’re not ready to make a deposit yet, you can play the High Fashion scratch card game for free in practice mode at VIP Casino. How much can I win on the high fashion scratch card?